Design Data and StruM.I.S will present a joint webinar that focuses on the interoperability between the two software solutions. The webinar, titled Seamless Communication for the Fabrication Process with StruM.I.S and SDS/2, will be held March 17. Project and manufacturing data can seamlessly be passed for full production management though the factory and engineering office. The link between SDS/2 and StruM.I.S adds an extra dimension to the way detailers work, especially without having to physically contact the StruM.I.S user. The process can also be easily setup to run automatically at periodic intervals, meaning even less hassle for the user. This seamless data exchange can potentially provide SDS/2 users with substantial cost and time savings over the course of a project. 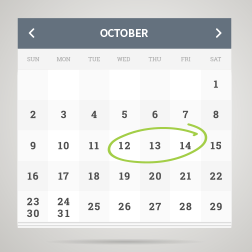 To accommodate users around the world, the webinar will be held at two different times. Click on the either of the times below to register for that session. 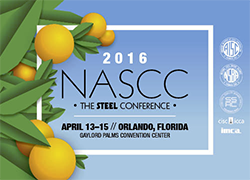 Design Data will be presenting two sessions at the upcoming NASCC: The Steel Conference, which will be held at the Gaylord Palms Convention Center in Orlando, Florida, April 13-15. Consider how much time you would save on every project if you could eliminate drawing cleanup. With SDS/2's detailing templates, we are taking drawing automation to a whole new level, reducing and, in some cases, completely eliminating clean-up time for shop drawings. At this session, you'll learn how this new groundbreaking technology works; our experts will also work with your drawing standards and show you what it will take to eliminate drawing cleanup. April 14, 8:00 a.m. - 9:00 a.m., Captiva Room. Good steel erectors can eyeball a piece of steel and instinctively know whether it’ll meet crane capacity. But to be AISC certified, you’ve got to provide documentation, which takes time to compile. SDS/2 Erector enables erectors to fast-track the documentation by utilizing the fabricator’s model to create lift plans and calculations, as well as manage and track steel on site. In this session, you'll learn more about how steel erectors are profiting from this technology. April 14, 10:15 a.m. - 11:45 a.m., Captiva Room. SDS/2 2015 offers much more flexibility for the layout and appearance of the bill of material (BOM) than in previous versions of SDS/2. You can now use different BOM layouts on each drawing, as well as add a BOM to any drawing type (in previous versions, a BOM could only be added to Sheet Outlines). You can also move a BOM as one entity by clicking and dragging, or by selecting and using the Move/Stretch command. Set the default appearance of a BOM when placed on a drawing in Job or Fabricator Options > Drawing Cosmetics under the Bill of Material tab. 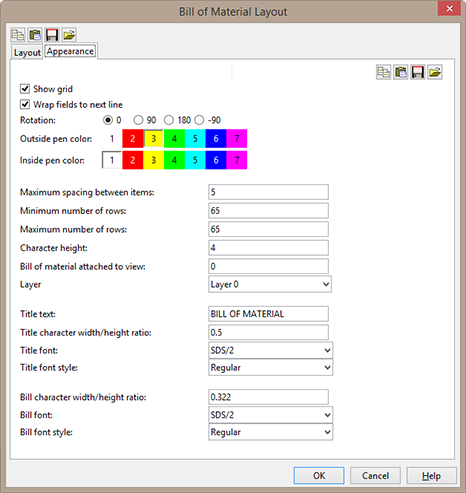 Options, as shown in Figure 1, include Rotation, Inside pen color, Outside pen color, Maximum spacing between items, Minimum number of rows, and Maximum number of rows. Once you have placed a BOM on a drawing, the default appearance can be changed by double-clicking it. 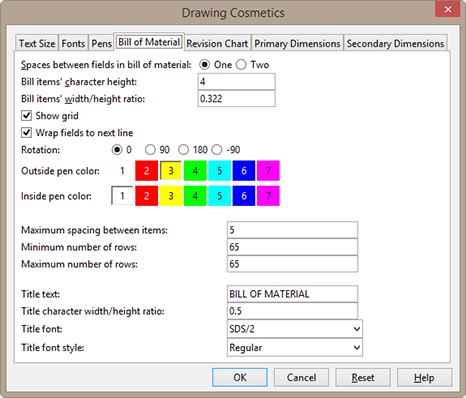 As shown in figure 2, the same options as seen in Drawing Cosmetics are available under the Appearance tab. Changing the appearance of the BOM here will only affect it on this drawing. The SDS/2 Users Group hosts an annual conference; this three-day event is primarily a learning opportunity. Activities include training on very specific topics determined by the Users Group, the unveiling of new enhancements, award presentations and other events. Both Design Data employees and SDS/2 customers present innovative SDS/2 techniques, encouraging users to employ the power of SDS/2 to its fullest. This conference also provides an opportunity for users to offer their input on new developments in SDS/2. The 2016 SDS/2 Users Group Conference will be held at The Embassy Suites in downtown Lincoln, Nebraska, October 12-14.